HP Umpire Carlos Torres ejected Yankees pitcher Tommy Kahnle (throwing at), Tigers DH Miguel Cabrera (fighting), and Yankees Manager Joe Girardi (arguing Kahnle's ejection/warnings) and 1B Umpire Dana DeMuth ejected Yankees catcher Austin Romine (fighting) in the bottom of the 6th inning and 1B Umpire Dana DeMuth ejected Yankees pitcher Dellin Betances and Bench Coach/Acting Manager Rob Thomson (throwing at Tigers batter James McCann after warnings) in the bottom of the 7th inning and HP Umpire Carlos Torres ejected Tigers pitcher Alex Wilson and Manager Brad Ausmus (throwing at Yankees batter Todd Frazier after warnings; all QOCU) in the top of the 8th inning of the Yankees-Tigers game. With none out and none on in the top of the 4th inning, Yankees batter Gary Sanchez hit a 3-2 slider from Tigers pitcher Michael Fulmer for a home run. With two out and one on (R1) in the top of the 5th, Sanchez took a first-pitch fastball from Fulmer for a hit-by-pitch. 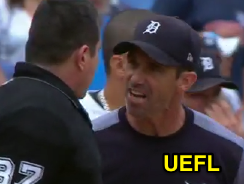 With two out and none on in the bottom of the 6th, Tigers batter Cabrera took a first-pitch fastball from Yankees pitcher Kahnle for a called first ball, resulting in an ejection and eventual bench-clearing incident. Replays indicate the pitch was thrown behind Cabrera and waist-high, the call was irrecusable. At the time of all 6th inning ejections, the Tigers were leading, 6-3. 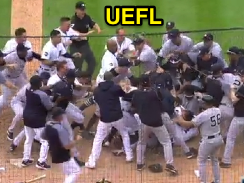 With none out and none on in the bottom of the 7th, Tigers batter James McCann took a 0-1 fastball for a hit-by-pitch, resulting in another bench-clearing incident. Replays indicate the pitched ball hit McCann in the helmet and warnings had previously been issued due to the previous throwing-at ejection, the call was irrecusable. At the time of the 7th inning ejections, the game was tied, 6-6. With one out and none on in the top of the 8th, Yankees batter Todd Frazier took a first-pitch fastball from Tigers pitcher Wilson for a hit-by-pitch. Replays indicate the pitch was located in Frazier's midsection and warnings had previously been issued due to multiple previous throwing-at ejections, the call was irrecusable. At the time of the 8th inning ejections, the Tigers were leading, 9-6. The Tigers ultimately won the contest, 10-6. These are Carlos Torres (37)'s sixth, seventh, eighth, ninth, tenth ejections of the 2017 MLB regular season. These are Dana DeMuth (32)'s first, second, and third ejections of the 2017 MLB regular season. Carlos Torres now has 16 points in the UEFL Standings (6 Prev + 5*[2 MLB + 0 Irrecusable] = 16). Dana DeMuth now has 9 points in the UEFL Standings (3 Prev + 3*[2 MLB + 0 Irrecusable] = 9). Crew Chief Dana DeMuth now has 10 points in Crew Division (4 Previous + 6 Irrecusable Call = 10). These are the 142nd, 143rd, 144th, 145th, 146th, 147th, 148th, 149th ejection reports of 2017. This is the 61st player ejection of 2017. Prior to ejection, Tommy Kahnle's line was 1.0 IP, 3 SO. These are the 71st and 72nd Manager ejections of 2017. This is the 62nd player ejection of 2017. Prior to ejection, Cabrera was 0-3 (SO) in the contest. This is the 63rd player ejection of 2017. Prior to ejection, Romine was 0-2 in the contest. This is the 64th player ejection of 2017. Prior to ejection, Betances' line was 0.0 IP, ER. This is the 65th player ejection of 2017. Prior to ejection, Wilson's line was 1.0 IP. 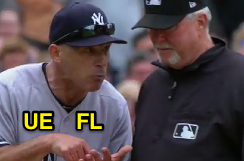 This is New York-AL's 6-10th ejection of 2017, 1st in the AL East (NYY 10; TOR 9; TB 6; BOS 4; BAL 3). This is Detriot's 6/7/8th ejection of 2017, 2nd in the AL Central (CWS 12; DET 8; KC 6; MIN 3; CLE 0). This is Tommy Kahnle's first career MLB ejection. This is Joe Girardi's 4th ejection of 2017, 1st since July 27 (Stu Scheurwater; QOC = N [Balls/Strikes]). This is Miguel Cabrera's first ejection since July 5, 2016 (Tim Timmons; QOC = N-C [Fair/Foul]). This is Austin Romine's first career MLB ejection. This is Dellin Betances' first career MLB ejection. This is Rob Thomson's first ejection since September 26, 2016 (Todd Tichenor; QOC = U [Throwing At]). 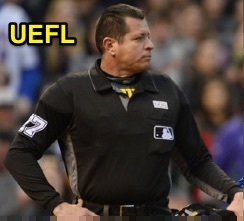 This is Alex Wilson's first career MLB ejection. This is Brad Ausmus' 4th ejection of 2017, 1st since August 14 (Angel Hernandez; QOC = Y [Balls/Strikes]). These are Carlos Torres' 6th-10th ejections of 2017, 1st since August 6 (Larry Bowa; QOC = N [Balls/Strikes]). These are Dana DeMuth's first ejections since May 24, 2016 (Colby Rasmus; QOC = N [Balls/Strikes]).